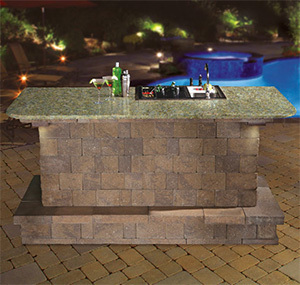 Complete with 2 pallets of Olde English Wallstones and a top of the line 30" Bull™ Bar Center package set in a polished granite countertop in a choice of Black Uba Tuba or Venetian Gold. 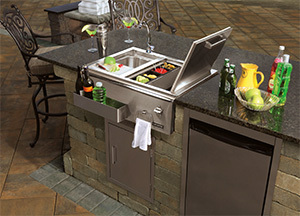 The finished bar also features a footrest that wraps around three sides. Ready to install... absolutely NO cutting necessary. Step-by-step instructions in English and Spanish included. Dimensions: 92" long, 43" deep, and 42" high. Toffee/Onyx with Black Uba Tuba granite shown. This style comes complete with 2 pallets of MaytRx 6 Wallstones and a top of the line 30" Bull™ Bar Center package set in a polished granite countertop in a choice of Black Uba Tuba or Venetian Gold. 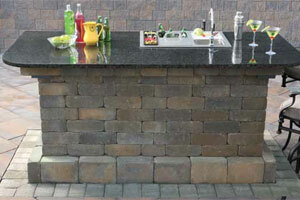 The finished bar also features a footrest that wraps around three sides. Ready to install... absolutely NO cutting necessary. Step-by-step instructions in English and Spanish included. Dimensions: 92" long, 43" deep, and 42" high. MaytRx Split Face Sahara/Chestnut with Venetian Gold granite shown.